As you fill out a Bruegger’s Bagels application, you’re joining a company that strives to be the best in fast-casual dining. They strive to use simple and fresh ingredients to give their customers a healthy and delicious meal. Links to apply for jobs at Bruegger’s Bagels are at the bottom of the page. Bruegger’s Bagels was started in 1983 by Mike Dressell and Nordahl Brue in Troy, New York. In June of 1996, the company was bought by Quality Dining and the founders joined the board of Quality Dining. By October of 1997, the company was sold back to Dressell and Brue after they raised concerns with the growth and operations of Quality Dining. Brueggers bought all of the retail operations of mmmuffins, Michel’s Baguette, and Timothy’s World Coffee through ThreeCaf Brands Canada, with the goal of continuing operations in November of 2009. 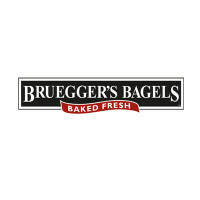 Groupe Le Duff bought out Bruegger’s Bagels and turned it into a subsidiary of the company. Currently, Bruegger’s Bagels has over three thousand part and full time employees spread across three hundred locations. There are franchises in twenty-six states, Washington DC, and one in Canada. By preserving the traditional ways of making bagels in the New York style, Bruegger’s bagels strives to give customers the best bagels they can make. When applying for Bruegger’s Bagels jobs online, you’re joining a company that strives to preserve tradition while giving great customer service and healthy food. By keeping food simple, the company aims to make it all delicious to keep customers coming back. Those with Bruegger’s Bagels jobs at the corporate level are generally located out of Burlington, Vermont, but there are District Manager positions available across the country. As the company spreads via franchises, there are several positions available in order to train new franchise owners to make sure that they’re successful. A franchise owner, before starting their store, will spend several weeks at a training bakery. For the first two stores that a franchisee opens, the corporation will provide a Franchise Operations Consultant to help get started. Those that are going for Bruegger’s Bagels careers at the local level will have little to do with the corporation because of the company’s structure. How old do you have to be to work at Bruegger’s Bagels? Age requirements vary by job, but for some you must be at least sixteen. Make sure to read all job requirements closely, as some require certain degrees or experiences, especially at the corporate level in order to make sure that they get the best candidates. As Bruegger’s Bagels is across North America, store hours vary. Generally, Monday through Friday, stores open between five and eight am, with several opening at five thirty am. Closing hours depend highly on location, running anywhere from three to nine pm. Weekend hours also tend to be shorter, especially on Sundays. District Manager – One of the major points of this job is to create a team of winning staff members who are driven to succeed. By keeping the bakeries in your district up to the company’s high standards, you will ensure that all customers are happy with the excellent service that Bruegger’s Bagels is known for. Compensation is around $65,000 a year. Assistant Manager – Being up early is a major part of this job as you will be up bright and early in order to help make sure that everything is prepared for the day. As a manger, providing leadership and vision will help you create and maintain a great team that is willing to work hard. Compensation is around $30,000 a year. Baker – You’ll be in charge of making all the quality bagels and other baked goods that this company is known for. When there are few people running the counter and they need help, or someone has an issue with a baked product, you will be called upon to help make sure that the guest’s experience is fantastic. Compensation is around minimum wage. Counter Associate – Making sure that guests have quick and efficient service is what this job is all about. Having a bright and pleasant attitude will encourage all guests to return because of the great service that you gave them. Compensation is around minimum wage. Delivery Driver – You will work closely with the Catering Coordinator and bakery staff to give a quick delivery of the quality product that all customers expect. By making sure that all orders are prepared correctly and on a timely basis, you will give all customers a positive impression of Bruegger’s Bagels as you are a brand ambassador. Compensation is around minimum wage. Why do you want to work at Bruegger’s Bagels? This is an extremely common interview question, so you should be prepared for it. Explain what drew you to the company, whether it was the company benefits or culture, and why it is your first choice to work at. What experience do you have? Highlight all relevant work experience that you have. Some jobs do not require you to have experience, so instead, talk about what you can bring to the job instead. Have examples that allow you to show what you’re talking about. Where do you see yourself in a few years? The interviewer is looking to see if you’re planning to stay with the company. Be realistic in your career expectations, but make sure that your interviewer knows that you’re willing to take on extra challenges and responsibilities in order to move up within the company. If you’re applying to be a delivery driver, you may be asked: Do you have a great driving record? Or: If you’ve been in any accidents, how did they happen? Make sure to be completely honest here. They want people who are good and efficient drivers, who will get their products to the destination quickly and safely. If you’re applying for a management position, you may be asked: What’s your management style? Your interviewer is looking to see if you’re a good fit with the team. They want to make sure that your style works with company policies, so it’s important that you’re honest and have plenty of examples to show why you’ll be effective as a manager. How to apply for Bruegger’s Bagels online: if you’ve decided to go for a corporate job, follow the second link and follow all the instructions. For a store job, follow the second link, you can either click on the apply button on the side bar with the store location that you want and fill out the Bruegger’s Bagels application there, or click on a location on the map locator and follow an application link from there. There is no printable application for Bruegger’s Bagels. Before your interview, do research on the company and the industry. Have a list of questions prepared that you’ll bring with you, several of your questions will probably be answered during your interview. Although this seems excessive, especially for an entry level job, it will place you ahead of the other candidates. The interview will be formal, so dress appropriately, business casual at the very least. If you’re going for a management position, a suit would be best. Have a respectful and positive attitude during your interview, it will give the interviewer a great impression and show that you can give the customers a great experience. Make sure to show gratuity at the opportunity to interview with Bruegger’s Bagels. Ask about the best way to check on your hiring status afterwards. Few applicants will get the job during the interview, especially for higher positions, as the company will want to screen all candidates before making a final decision. Braum’s Ice Cream And Dairy Store: See this page for jobs at Braum’s Ice Cream And Dairy Store. TCBY: TCBY offers opportunities for both, beginners and experienced roles. Yogen Fruz: For employment at Yogen Fruz visit the application page. Mrs. Fields Cookies: Mrs. Fields Cookies offers opportunities for both, beginners and experienced roles. Nestle Toll House Cafe: Nestle Toll House Cafe offers opportunities for both, beginners and experienced roles.